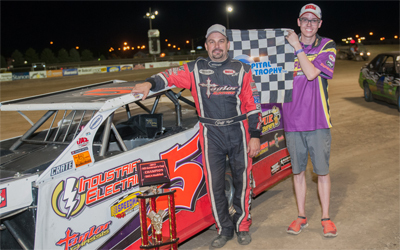 Dacotah Speedway hosted the 25th Annual North Dakota Governor's Cup Friday, July 24th and Saturday, July 25th. The two day show featured IMCA Modifieds, WISSOTA Street Stocks, INEX Legends, Hobby Stocks and IMCA Sport Compacts as well as IMCA Stock Cars and WISSOTA Late Models. Fans were in for an extra treat as the IMCA Modifieds made up their feature from the rained out night of June 19th. 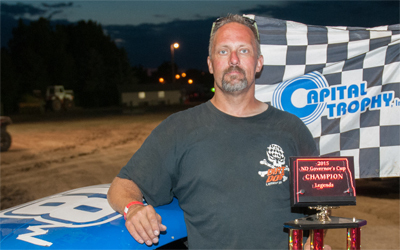 On the first night of the Governor's Cup, Mike Swallers started on the pole in the IMCA Stock Car feature but outside pole sitter Bob Fuegmann grabbed the lead at the green flag. Rob Stenvold and Swallers raced side by side for second before Stenvold took the position. Swallers faded through the field as Joren Boyce and Billy Preston slipped by for third and fourth. Boyce and Preston quickly reeled in second place Stenvold and drove by before Stenvold got too high in turn two. A lap five caution reset the field and on the restart, Preston and Boyce passed Fuegmann for the lead. Fuegmann rallied back and it was a three car battle for the win. Preston shuffled into the lead as Boyce and Fuegmann raced side by side for second while Stenvold lurked in fourth. Stenvold got loose in turns one and two, losing valuable ground on the leaders. With five laps to go, Boyce caught leader Preston and they raced side by side the win. As they battled hard, Fuegmann took it three wide and powered into the lead. Bob Fuegmann held off Billy Preston and Joren Boyce to win the feature and his first Governor's Cup championship. Rob Stenvold finished fourth ahead Tyler Ashley. In the IMCA Modified make-up feature, Brad Kadrmas led the first last before Rusty Kollman took the lead on lap two. A lap three caution regrouped the field and on the restart, Hank Berry and Jeremy Keller split and passed Kollman for the lead. Berry and Keller raced door to door before Keller grabbed the lead on lap four. Berry fell into the clutches of third place Marlyn Seidler and they briefly raced side by side until Seidler passed Berry for third. Seidler's low line around the track quickly reeled in Keller and on lap seven he slipped into the lead. Seidler pulled away from the field as Keller ran into mechanical problems that ended his night early. Mark Dahl and Jason Grimes raced side by side for second before Grimes took the position with 10 laps to go. As Seidler started getting into lapped traffic, Grimes quickly caught Seidler. Using the lapped traffic to his advantage, Grimes passed Seidler for the lead just before back-to-back cautions set up a six lap shootout. On the restart, Shawn Strand passed Dahl for third but Dahl rallied back to retake the position with four laps to go. Strand then had his hands full with Spencer Wilson. With two laps to go, Wilson dove low under Strand but Strand hung on to finish fourth. Mark Dahl finished third while Marlyn Seidler finished a distant second behind feature winner Jason Grimes. Cole Schill and John Kaanta started on the front row of the 40 lap WISSOTA Late Model feature. Kaanta took the lead as Jason Wolla, Jake Redetzke and Aaron Turnbull raced three wide for third place. Turnbull motored by Wolla and Redetzke to take third and quickly caught second place, Schill. A quick lap three caution allowed Turnbull to pass Schill on the restart. Schill started fading through the field, losing positions to Wolla, Jeff Provinzino, Redetzke and Jeff Wildung. Lapped traffic slowed Kaanta down and Turnbull quickly caught the leader. They briefly raced side by side until Turnbull took the lead with 23 laps to go. However, Turnbull struggled negotiating through the lapped traffic and Kaanta retook the lead with 10 laps to go. Kaanta started to pull away as Wildung started to reel in Turnbull for second. Wildung ran out of time and had to settle for third behind Turnbull and feature winner John Kaanta. Jake Redetzke finished fourth while Jeff Provinzino rounded out the top five. 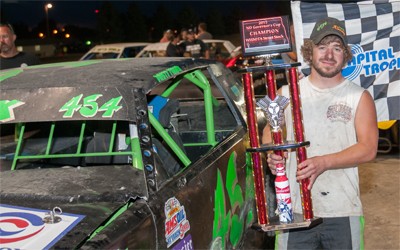 The IMCA Sport Compacts kicked off night number two of the North Dakota Governor's Cup. Menoken's Josh Roehrich quickly took the lead and pulled away from the field. It was now a race for second between Jason Berg and Kody Stoxen. As they raced hard, young Chance Seelye quickly caught them making it a three car battle for second. Seelye passed Berg for third place who then fell into the clutches of Brandon Anderson. However, Anderson could not complete the pass and Berg held on to finish fourth. Chance Seelye finished third behind Kody Stoxen as Josh Roehrich dominated race to pick up his fourth feature victory of the season and second Governor's Cup championship. Napoleon natives Jaren Wald and Wyatt Rath-Wald led the field to the gree n flag in the Hobby Stock feature. The cousins raced side by side until Wald cleared Rath-Wald for the lead. Rath-Wald didn't give up as he rallied back and took the lead on lap seven. A caution on lap eight reset the field and on the restart, John Gartner Jr passed Nathan Messer for fourth as Brent Vetter raced side by side with Wald for second. A red flag halted the race with eight laps to go for a small fire under the hood of James Weber's car. On the restart, Wald dove low under Vetter to take second place but Vetter came back to challenge for the position. They briefly raced door to door before Vetter retook second place. Vetter was all over Rath-Wald's bumper but Rath-Wald hung on to win his fourth win in a row at the Dacotah Speedway, his sixth of the season and first Governor's Cup championship. Jaren Wald finished third ahead of Josh Roehrich and John Gartner Jr. Pole sitter Andrew Jochim led the INEX Legends feature as Casey Martin and Donavin Wiest battled for second. Wiest's low line around the track gave him the momentum off the co rners to take second from Martin and catch leader Jochim. Wiest was all over Jochim's rear bumper while Martin tried to hold off Ivan Sailer and Shane Williams for third. Williams, who started eighth, shuffled into third before a caution came out with eight laps to go. On the restart, Jochim, Wiest and Williams were three wide for the lead. Jochim held onto the lead as Wiest and Williams battled for second. While running fourth, Martin's engine let go, ending his night and bringing out the caution with four laps to go. Once again, Jochim, Wiest and Williams were three wide on the restart. The highline prevailed for Williams as he took the lead with three laps to go but Wiest charged back on the bottom. As they raced out of turn four and to the checkered flag, Williams held off Wiest by just a few inches to win his first feature of the year and first Governor's Cup championship. Troy Hoff made a last lap pass on Andrew Jochim to take third while Ivan Sailer rounded out the top five. After a brief intermission, the WISSOTA Street Stocks hit the track next. 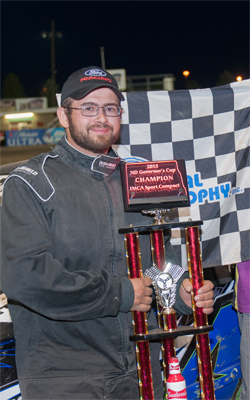 Pole sitter Jeremy Schmidt held onto the lead while Eric Harpole and Chris Michaelsohn raced for second. Michaelsohn grabbed the position from Harpole and two laps later, Dustin Frank slipped by for third. Michaelsohn and Frank cut into Schmidt's lead and it was a three car battle for the lead. A caution on lap 12 put Michaelsohn and Frank on Schmidt's rear bumper and on the restart, Frank passed Michaelsohn for second before another caution slowed the race. Schmidt, Frank and Michaelsohn went three wide on the restart but Schmidt held onto to the lead. Frank threw his car in low under Schmidt and they raced side by side for the win. As they took the white flag, Frank cleared Schmidt for the lead as Michaelsohn looked under Schmidt for second. 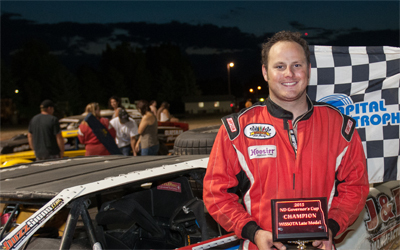 Dustin Frank led the final two laps to win his second career feature victory at the Dacotah Speedway and first Governor's Cup championship. Chris Michaelsohn made a last lap pass to finish second over Jeremy Schmidt. Eric Harpole finished fourth ahead of John Fiest. Jeremy Keller and Jason Grimes battled for the lead in the IMCA Modified feature. Keller would win the battle as Robert Hellebust passed Jeff Taylor for third. Taylor rallied back to retake the position and quickly chase down Grimes for second. On lap seven, Taylor blew by Grimes and two laps later he passed Keller for the lead. While running second, Keller had mechanical problems once again and brought out the first caution as he limped back to the pits. A series of quick cautions didn't slow Taylor as he pulled away from Grimes and Hellebust each time. On the final restart of the night, Taylor quickly distanced himself from the field while Hellebust tried to hold off Aaron Turnbull for third. Turnbull briefly got off the track on the backstretch which allowed Mike Hanson to pass him for fourth. As they took the white flag, Hanson got a flat right rear tire but a spin in turn one ended the race under caution. Race officials went back to the last completed lap which placed Hanson fifth, just behind Aaron Turnbull. Robert Hellebust finished third behind Jason Grimes and feature winner and back-to-back Governor's Cup champion Jeff Taylor. The WISSOTA Late Models ended the weekend with a 40 lap feature. Hank Berry started along side Jake Redetzke from Eau Claire, WI. Redetzke quickly grabbed the lead before a series of quick cautions. Redetzke, Berry and Jeff Provinzino broke away from the field while Jeff Wildung had his hands full with Tyson Turnbull. Berry, who had the fastest car on the track, looked low under Redetzke but struggled to complete the pass. Redetzke and Berry started catching lapped traffic with 20 laps to go but Redetzke struggled getting around the slower cars. Berry passed Redetzke in lapped traffic with 17 laps to go and started to pull away. However, Berry made contact with a lapped car and Redetzke was all over his rear bumper. Redetzke looked low under Berry but Berry had better drive off the corners. Berry held off Redetzke by a car length to win the feature. Jeff Provinzino finished third while Jeff Wildung crossed the finish line fourth ahead of Tyson Turnbull. 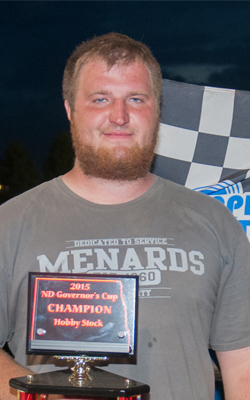 Jake Redetzke was crowned the Governor's Cup champion in the WISSOTA Late Models.